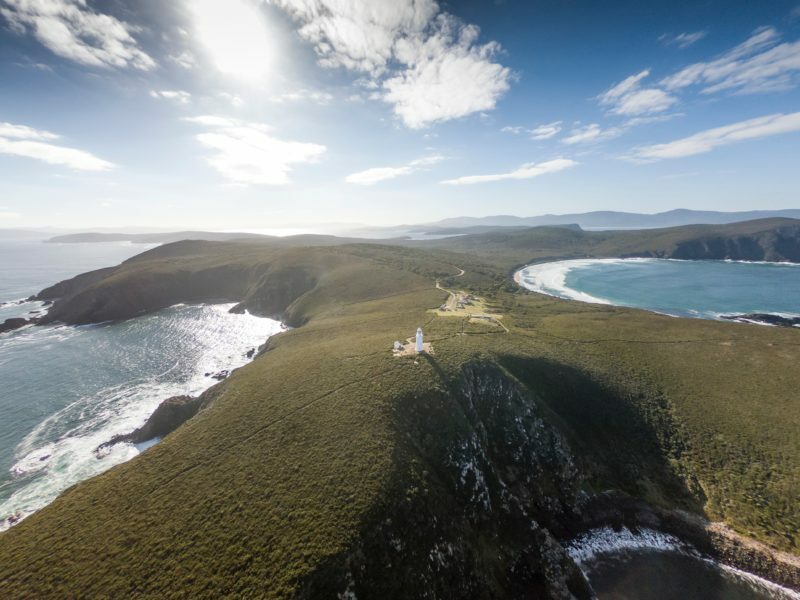 Experience the raw beauty of Bruny Island’s coastline and enlightening historic tour of the Cape Bruny Lighthouse, with mesmerizing views from the Lighthouse balcony and surrounding jagged sea cliffs of Southern Tasmania. 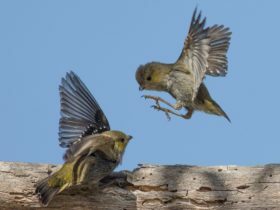 The drive into the South Bruny National park departing from Hobart and crossing to the island by ferry is an experience on its own with many wonderful lookouts along the way. Enter the lighthouse with your expert tour guide and climb the spiral stairs to the Prism room and hear stories of an era long forgotten by many. 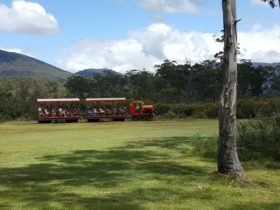 The photo opportunities from the balcony are plentiful, making this a must do on Bruny Island. The superbly engineered lighthouse prisms remain in working order and are unique to see close up. 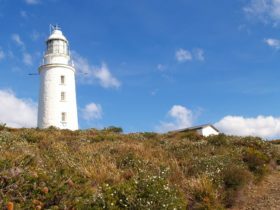 Learn about this early iconic navigational landmark, how it was built by convicts, and how life was for a lighthouse keeper in this far south corner of our world. 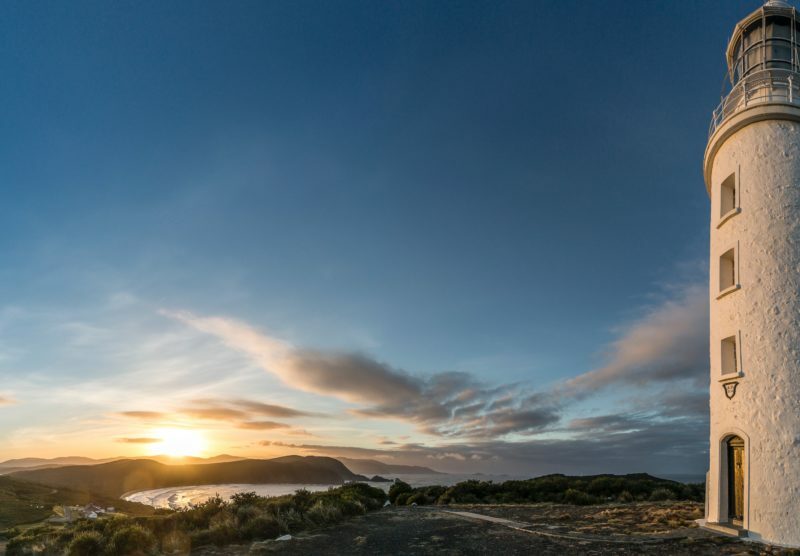 The Lighthouse is on the Southern tip of the island and it takes about a one-hour drive from the ferry terminal and about a 45-minute drive from Adventure Bay. 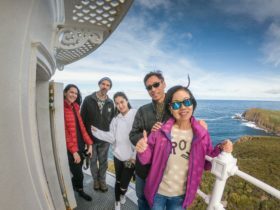 A fully guided and interpreted lighthouse tour of the Cape Bruny Lighthouse. Climb the original wrought iron spiral staircase to the tower balcony and take in the sweeping southern views to the wild Tasman Sea, South East Cape, Whale Head and the small islands dotting the coastline. Experience the vastness and wonderful photo opportunities at every point of the compass with albatross, gannets and many other pelagic seabirds gliding over the relentless ocean swells. 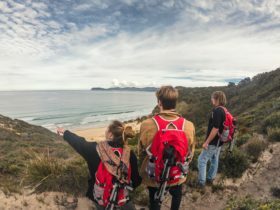 Observe migrating whales, short tailed shearwaters and wedge tailed eagles swooping close to the tower. The tour commences at the tower where you will meet your guide. This tour is not suitable for children under 5 years.